Neither of my older two children ever fixated on a certain word. They had things they liked, they learned the usual vocabulary as they got older, nothing out of the ordinary. 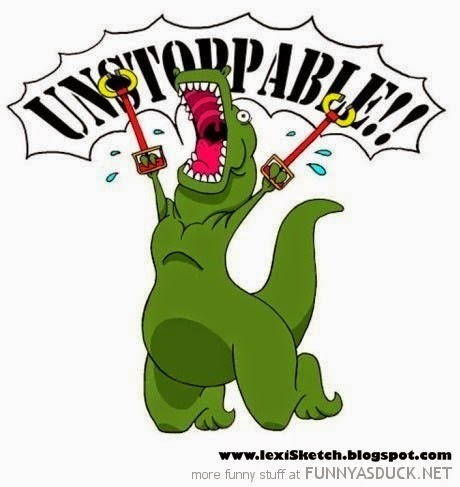 I do love me some T-Rex humor though. But of course, H would have to be the out of the ordinary child for me. He learned the word "dinosaur" and says it about 5,000 times a day! It's not like he doesn't know any other words, he actually knows a lot! He's 2 and a half and I would say he's probably on par with the amount of words he should know. Now we are focusing on learning letters and counting. But back to this dinosaur thing. But now he says the word dinosaur ALL THE TIME. He will say his normal words here and there, but then randomly start saying "dinosaur" or pointing at things and saying "dinosaur." It is driving me batty, which if you follow my blog, you know he already does in a thousand other ways, so I definitely don't need another one. I know that as he continues to learn normal grammar and more sentences, etc., he will realize that saying "dinosaur" a trillion times a day makes absolutely no sense. But until then, the duct tape I have already placed on my incredibly frayed nerves is starting to peel off and I don't know what else I can put on them before my nerves start snapping and flying out all the holes in my head.